My two boys are growing up fast. Not just in the figurative sense, they are growing like weeds. In one day they can eat enough for two adults. I don't know where they put all the food, they are both very thin and eat constantly throughout the day. I really wish that we could swap metabolisms. While my metabolism is still great, it isn't what it was in my teens. In order to make everyone satisfied at dinner time, I have been buying a lot of marked down meat at the grocery store. I love when meat gets marked down. It saves a ton of money and lets me buy meats such as lamb which are normally out of my grocery budget. Last month I was able to find 8 packages of lamb for only 2 dollars a pound, so I stocked my freezer. Then I had the task of figuring out what recipes would work for 8 pounds of lamb. One recipe that I found for Kofta Kebabs from Allrecipes.com looked very easy and full of flavor. This recipe has 13 ingredients (including skewers). It takes 1 hour and twenty minutes of total time and makes 28 servings. I made a few modifications to this recipe. First of all I forgot to buy parsley at the grocery store, so I omitted it from the recipe. Secondly, I ran out of time before dinner and didn't have the time to let the skewers sit in the fridge before grilling. So I skipped this step. Additionally I chose to grill four meatballs on each skewer. The one meatball on each skewer idea seemed like a waste of skewers and time for me. Plus my kids with multiple skewers would have spelled disaster. Since I use an indoor grill my total grilling time was longer than the recipe. My kebabs took approximately 10-15 minutes to cook. I followed the remainder of the recipe as written. These kebabs were very good. I do think that they would benefit greatly from a yogurt sauce. I served my kebabs with a simple yogurt sauce made from yogurt, cucumber and mint. Tahini would also work well. My two boys loved that this dinner was served on skewers (with lots of supervision). I would suggest with younger kids to take the kebabs off the skewers when serving. 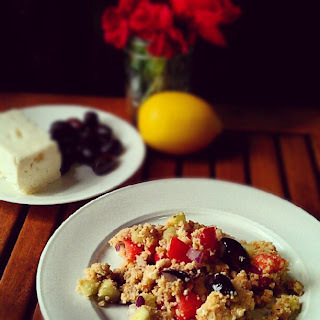 I served the kebabs with a couscous salad with olives, cucumbers, and red onion. They were delicious together. Overall a simple and delicious lamb recipe. For the recipe go to Kofta Kebabs. These look really good and I love, love, love your new look! They were very yummy :) Thanks for the sweet comment! New follower! Love your site and looking forward to reading more! I already follow you :) Thanks for the sweet comment, come back again soon! These are my favorite appetizers at our local Greek restaurant.. You are absolutely right, they are great with cucumber/yogurt dip.. They really are great with yogurt sauce, yum! Wow! Great appetizers! I am already a follower. Thank you for following back. I've found people love food on a stick. I've always wanted to try meatballs on kabobs but they always fell apart...I'd love to try this! I love kebabs they are so fun to eat :) These were actually very easy to get to stay on the skewers, which was nice!